'2 Cool 2 Be 4gotten', which stars Khalil Ramos, Jameson Blake and Ethan Salvador, will be in competition for the 32nd Lovers Film Festival - Torino GLBTQI Visions this June in Turin, Italy. 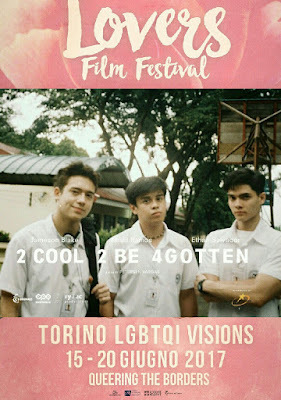 Over 80 films in 4 categories will be screened in the said filmfest, with '2 Cool 2 Be 4gotten' listed under the category "All the Lovers (International Feature Film Competition)", vying for the "Ottavio Mai" prize worth 1000 euro. There's actually another entry from the Philippines that made it to the 2017 Lovers Film Festival, the short film 'Contestant #4' by Jared Joven and Kaj Palanca which will be screened under "Future Lovers (International short film competition)".